FILE - North Korean leader Kim Jong Un, center, provides guidance on a nuclear weapons program in this undated photo released by North Korea's Korean Central News Agency (KCNA) in Pyongyang, Sept. 3, 2017. U.S. President Donald Trump's re-listing of North Korea this week as a state-sponsor of terrorism - a largely symbolic move — and the announcement of tightened sanctions on Tuesday were generally welcomed by analysts as stepped-up pressure on Pyongyang to give up its nuclear and missile programs. 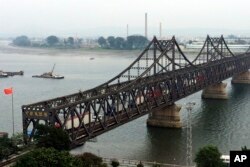 But analysts question whether the moves, which also target Chinese trade, can get North Korea to the negotiating table. FILE - Ambassadors to the U.N. vote during a United Nations Security Council meeting on North Korea in New York City, Sept. 11, 2017. New U.S. sanctions announced Tuesday against North Korea may add some substance to the symbolism, but only if China — which accounts for almost all of North Korea’s trade — decides to help. The U.S. Treasury Department targeted 13 businesses and 20 ships linked to North Korea’s funding for nuclear and ballistic missile programs, which it says amounts to more than $750 million in trade — between Beijing and Pyongyang. The sanctions are on trade and labor contractors, including a North Korean company that has operated in China, Cambodia, Poland, and Russia. But the unilateral measures, analysts said, only prevent U.S. companies and banks from doing business with those sanctioned, which was already happening in practice. Nonetheless, the added onus to doing business with Pyongyang — now a designated state terrorism sponsor — could encourage actions outside the U.S., said Daniel Pinkston, a North Korea scholar at Troy University in Seoul. “We’ll have to see what other states do, if they take similar measures or if they reassess their relationship or if they suspend any kinds of economic relations, which we’ve seen some states doing anyway,” he said, pointing to Singapore and the Philippines as examples. “Maybe this will encourage other states to take a similar response," he said. 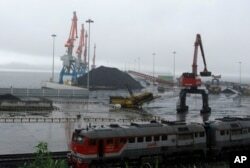 FILE - Coal brought from Siberia can be seen awaiting loading onto a ship bound for China in the North Korean special economic zone of Rason. Sanctions are squeezing North Korea’s economy more than in the past because China’s enforcement has been much stronger, said Benjamin Katzeff Silbertstein, contributor to 38 North, a program of the U.S.-Korea Institute, and co-editor of North Korean Economy Watch . “North Korean labor abroad, for example, has been sent home. And, it’s been much much more difficult for North Korean companies to export minerals and other goods that fall under U.N. sanctions. So, the way it seems right now, the economy is taking a hit from the sanctions. And, the question is, how long this type of pressure will be kept up by China,” said Silberstein. The timing of the added pressure on North Korea could work against bringing it to negotiate an end to its nuclear and missile programs. After a recent string of missile tests, and its sixth and largest nuclear test in September, North Korea’s military testing has been quiet, raising speculation that Pyongyang may be waiting to see what the U.S. offers to entice it to join talks. China has been pushing what it calls a “freeze for freeze” agreement that would halt U.S. and South Korean large-scale military drills in return for North Korea suspending its testing and nuclear program. The U.S. has maintained North Korea must cease its program before negotiations can begin. 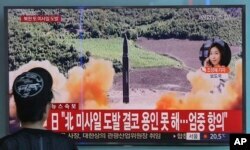 "That’s based on the assumption that the likelihood or the probability of returning to dialogue was high or the two sides were going to meet or there was going to be some diplomatic process that was going to be initiated,” Pinkston said, "and that possibly North Korea would bargain in good faith to fulfill its previous non-proliferation commitments and work towards denuclearization, but I think that’s unlikely,” he said. Despite being shot five times and suffering from infections and parasites, the soldier survived after getting medical treatment in South Korea. 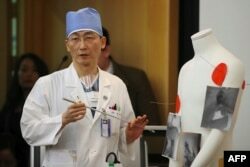 South Korean surgeon Lee Cook-Jong, who operated on North Korean soldier and his gunshot wounds, speaks about the condition of the soldier at Ajou University Hospital in Suwon, south of Seoul, Nov. 15, 2017. 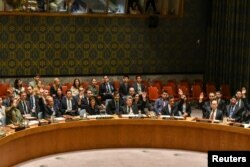 The United Nations Command, the unified command structure for the South Korean side of the border with North Korea, said on Wednesday the North's Korean People's Army violated the 1953 Korean Armistice Agreement. UNC Commander General Vincent K. Brooks at a briefing for media showed a video of the soldier’s defection and the violations, which included firing across the Military Demarcation Line and one KPA soldier briefly chasing the defector across the line. “The armistice agreement was challenged, but it remains in place,” he said in a statement. South Korea, Japan, and Australia were among the countries quick to voice support for Pyongyang’s return to the state terror sponsor designation, while China was reserved in its response. North Korea did not immediately respond to being accused again of sponsoring terrorism but lashed out at Trump for insulting the leadership in Pyongyang during a speech this month in South Korea. The U.S. president called North Korea a “murderous regime,” a sentiment he repeated this week. The U.S. first put North Korea on the terror sponsor list for the 1987 bombing of a South Korean commercial plane, which killed all 115 people aboard. Washington removed Pyongyang from the list in 2008 to reward it for progress on dismantling its nuclear programs under a six-party deal, which it later violated. North Korea joins Iran, Sudan, and Syria — the only countries designated by the U.S. as state sponsors of terrorism.